When you stay at Hampton Inn Jackson/Pearl-Jackson International Airport in Pearl, you'll be near the airport, within a 15-minute drive of Mississippi Coliseum and Jackson Convention Complex. This hotel is 1.3 mi (2.1 km) from Trustmark Park and 4.2 mi (6.8 km) from LeFleur's Bluff State Park. With a stay at Comfort Inn in Pearl, you'll be within a 15-minute drive of Mississippi Coliseum and Jackson Convention Complex. This hotel is 1.3 mi (2 km) from Trustmark Park and 4.2 mi (6.8 km) from LeFleur's Bluff State Park. When you stay at Holiday Inn Express & Suites Jackson / Pearl Intl Airport in Pearl, you'll be near the airport, within a 15-minute drive of Mississippi Coliseum and Jackson Convention Complex. This hotel is 1.3 mi (2 km) from Trustmark Park and 4.2 mi (6.8 km) from LeFleur's Bluff State Park. Located in Pearl, Country Inn & Suites by Radisson, Jackson-Airport, MS is on a lake, a 4-minute drive from Trustmark Park and 10 minutes from Brandon Amphitheater. 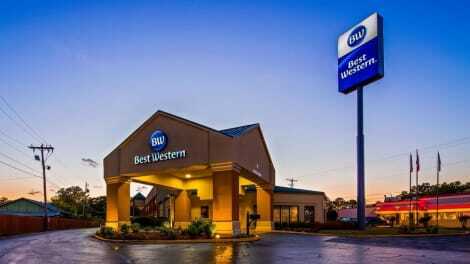 This eco-friendly hotel is 5.8 mi (9.3 km) from Mississippi Coliseum and 6.2 mi (9.9 km) from Mississippi State Capitol.